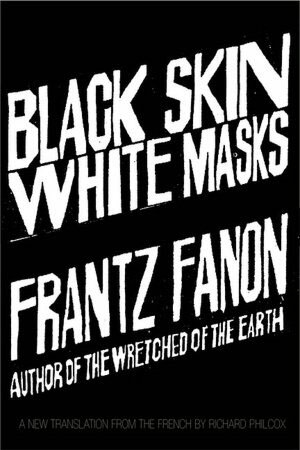 If Wretched of the Earth is Fanon’s manual for anti-colonial revolt, Black Skin, White Masks is the intellectual backbone behind it. 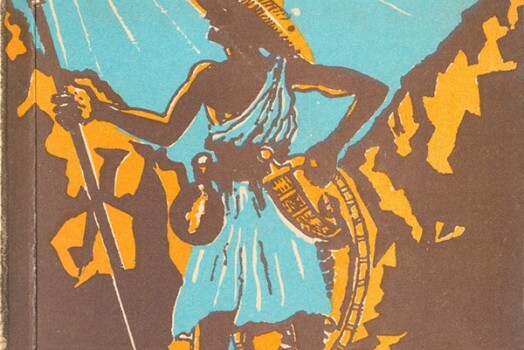 Originally published in 1952, and based on his rejected doctoral thesis, it lays out the ideas behind the revolt—the psychological effects of colonialism. 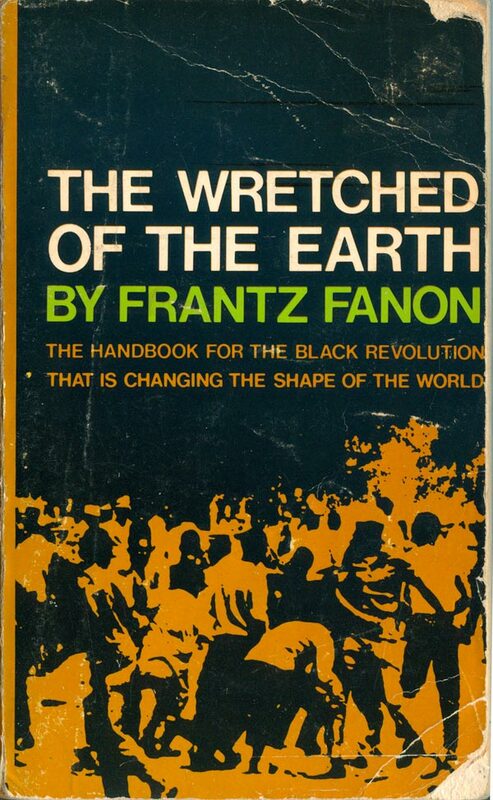 Although it is Fanon’s first book, it wasn’t published in English (by Grove Press) until 1967, six years after his death, and four years after Grove published Wretched of the Earth. 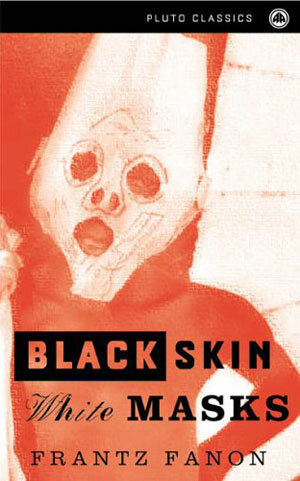 Black Skins is not a handbook for revolution, so it demanded a different cover treatment. 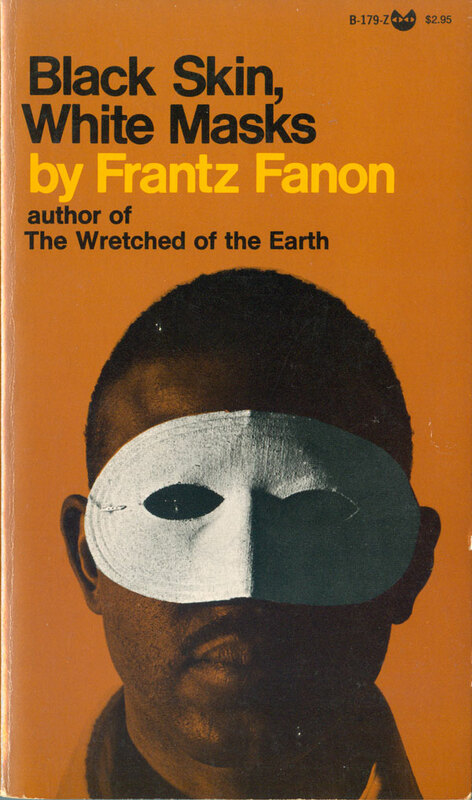 What Grove went with was straight type, hand-rendered, which is very similar to the original Wretched dust jacket (see HERE), and a definite break with the Wretched paperback which was circulating in 1967. By 1968 someone at Grove must of decided they needed a punchier cover for the pocket paperback edition, so they came up with the cover at the below right. It hasn’t had the lasting power that the paperback cover of Wretched did, but in many ways it works just as well. All it does is directly illustrate the title, but the image is clear, direct, punchy, and most importantly a bit discomforting. There is simply something a little creepy about the image, maybe it is the eyeless-ness of the mask, which makes me wonder if it is a single photo, or a montage, with the mask laid on top of the face by the designer. The mask is also a toy, a party mask, which brings all kinds of interesting associations to the title of the book. That cover lasted almost 25 years, but was given a redesign in 1994. Typical of Grove, the redesign has a 90s postmodern book design feel, with a return to the original text-based cover, but with a facelift combining serifed and sans-serifed type, and the red triangle pattern which vaguely evokes teeth and/or a textile pattern. I find this cover troubling. 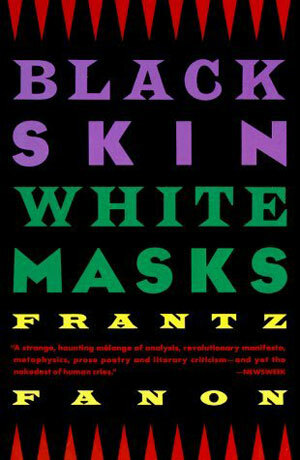 The black background feels like it is threatening to swallow the text, and the colors and pattern evoke a vague sense of the “tribal,” elements which add up to a negative evocation of a generic and dangerous “Africa.” Not only is this politically questionable, it doesn’t do service to the book (even if it might help sell it). In 2008 the American edition went through another redesign, this time going backward, pulling the title and author text off of the original cover design, cocking them at an extreme angle, and setting them both in white on a solid back background. In many ways this is but a simplification of the original, done much more directly than the 94 edition. But the work appears so hasty and rough that it actually makes the design look like the cover for a zine-style excerpt of the original. 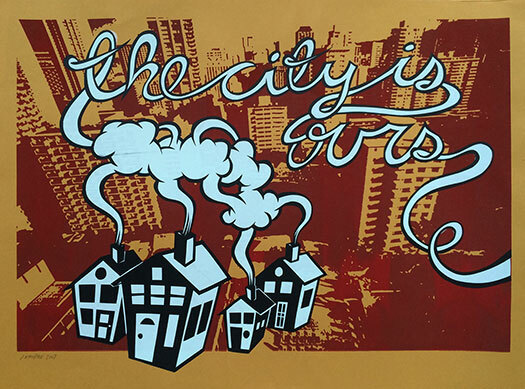 This would likely have looked great on a booklet photocopy of the book, but on the high-gloss actual object, it ends up looking sloppy and ill-conceived. 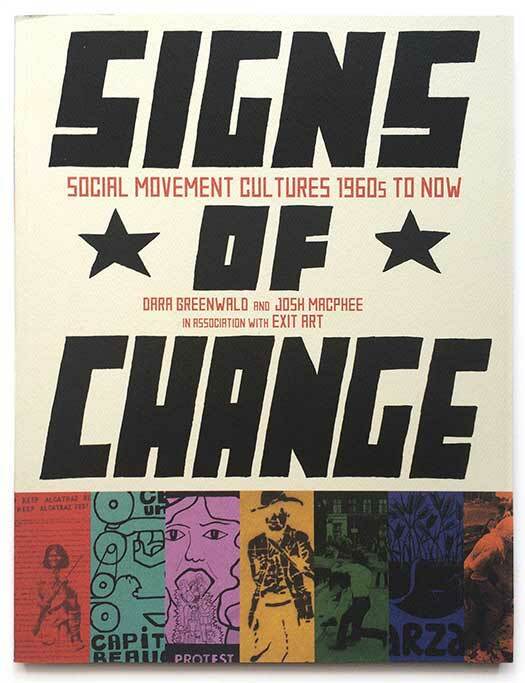 The initial UK edition, by MacGibbon and Kee in 1968, also goes with straight type, but forgoes the long subtitle, and neatly stacks the authors name and title vertically next to each other. Once again we also have a predominately black cover, but unlike what I’ve argued about the book Black Power (see HERE), it seems an awkward metaphor for the content of the book. 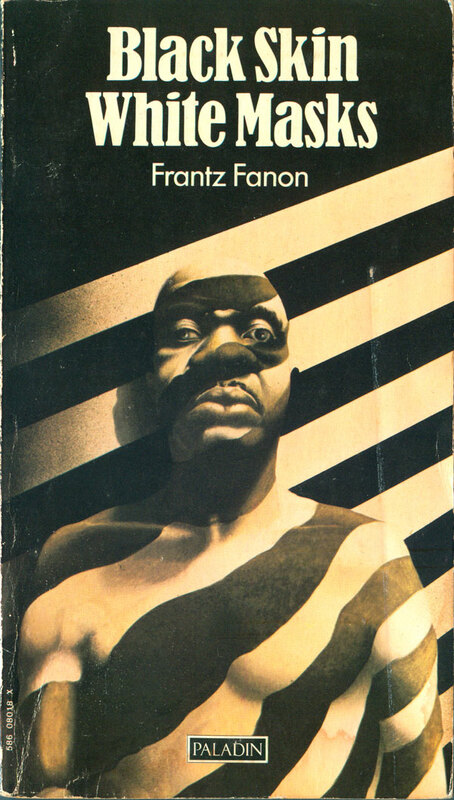 In 1973 Paladin came out with a paperback, which has one of the most interesting Fanon covers I’ve seen. Is it a painting of a Black man run over by a paint truck? There is no doubt that the whiteness is being imposed on him, and their is a certain violence in it, as it does look like a combination of skid marks and caution tape. At the same time, it is missing all the elegance of the Grove paperback with the mask, and reads as a bit hokey. The painting is realistic, but the figure’s features are exaggerated, so he looks like a clay-mation version of an African. Overall it’s quite strange. 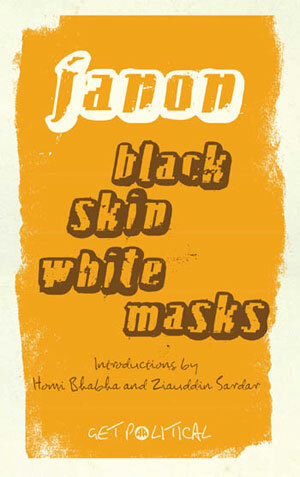 In the 90s or early 2000s, Pluto Press must have bought the rights to Black Skin, and republished it in their Classics series. 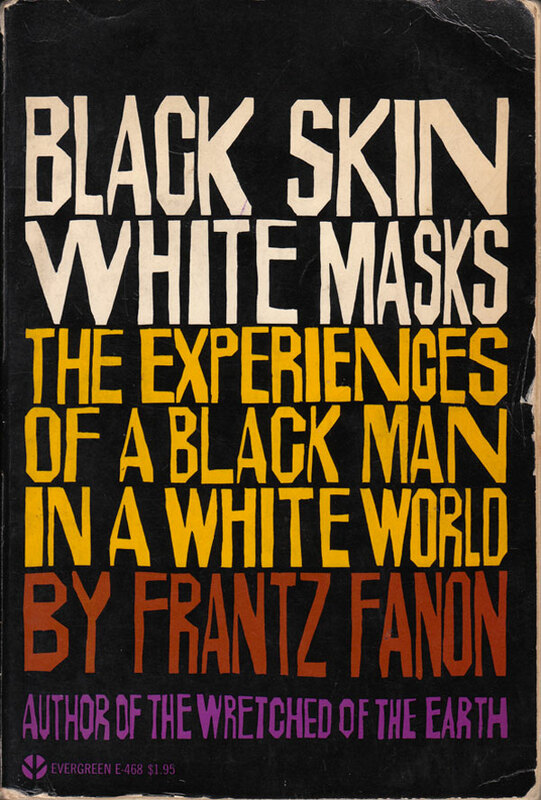 The first edition is another in this line of strange covers, with a crude drawing of what appears to be a Black child in a Klan hood. Maybe the association is less direct in the UK, but it is hard to not read it that way here. It has some of the same disturbing pull as the Grove cover, but has upped the creepy quotient without making it anymore interesting. In 2008 they covered the book with the new house style for the classics, which for no apparent reason mixes a primary font which is pixelated with a hand brushstroke background. I’ve always been puzzled with the general design of this series. 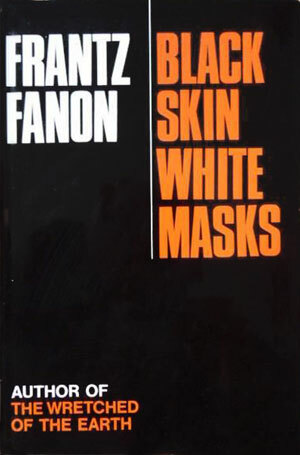 Next install will have all the Black Skin, White Masks covers in other languages. But before that, to follow up on the last couple posts. 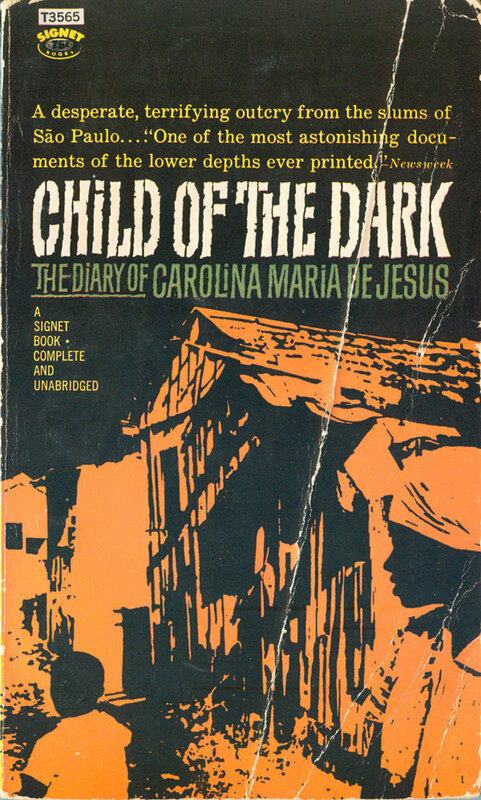 When digging around in a used bookstore in San Francisco, I found an interesting cover for Carolina Maria de Jesus’ autobiography Child of the Dark. I immediately felt like I had seen the cover before, and maybe I had, but it also dawned on me that it has an strikingly similar cover to the Grove paperback edition of Wretched of the Earth. They both have similar general design—text sitting on top of an over-saturated stylized image—and both use the same color scheme, not similar, but the exact same color scheme. I believe they were both first published in 1963 in these editions, but since both were popular books printed in many pocket-paperback editions, I haven’t been able to source which actually came first. In addition, neither book has a designer credited. 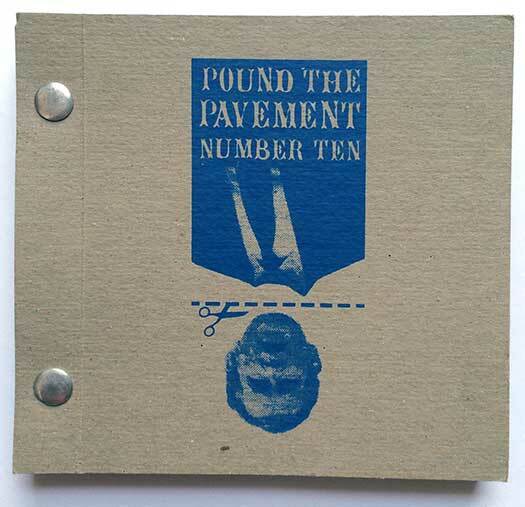 Anyone out there have any insight into this small book cover puzzle? Also, a couple weeks back Ethan H. had figured out that I screwed up, and overly trusted google translate. A cover I believed was a Hebrew edition of Wretched of the Earth was actually something completely different. Well, he took pity on me, and even dug up this great Arabic Wretched of the Earth cover! 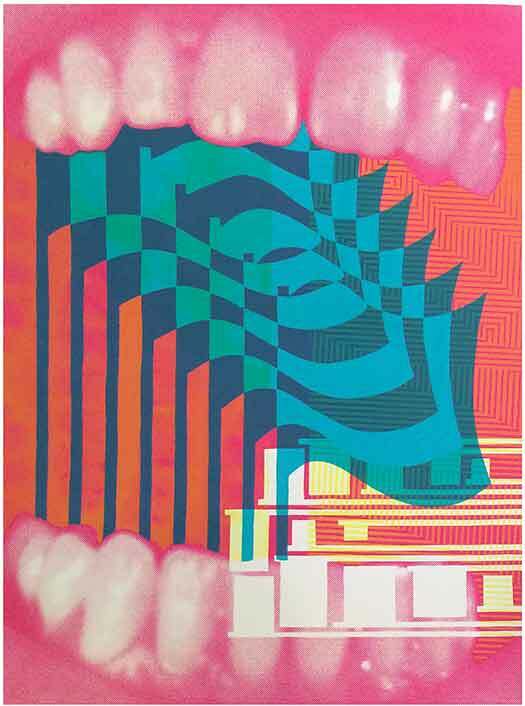 I don’t know the date, publisher, or designer, but I do know it was published in Beirut. Enjoy. Thanks Josh, lucid as ever! thank you for this great contribution. 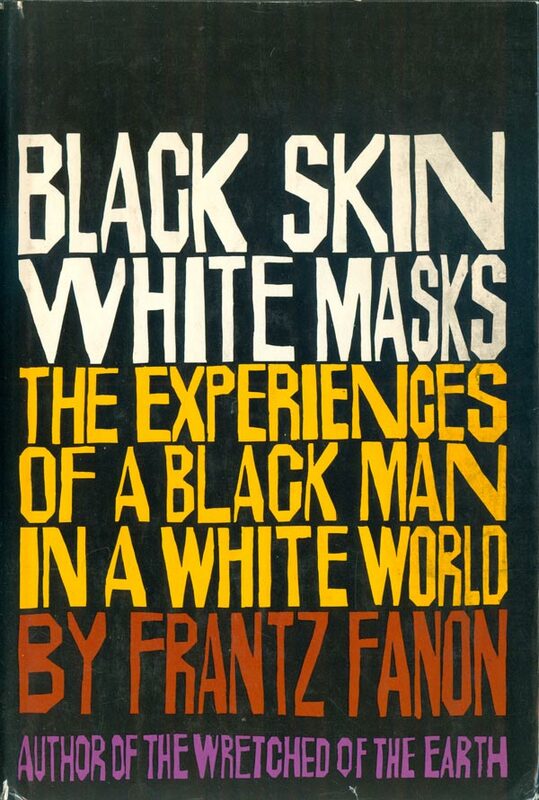 We would be quite thankful if you could get in touch with us, because we are looking for a high-res image of the cover of the first edition of “Black Skin, White Masks” for a forthcoming publication in Germany. Thanks ahead and best regards! 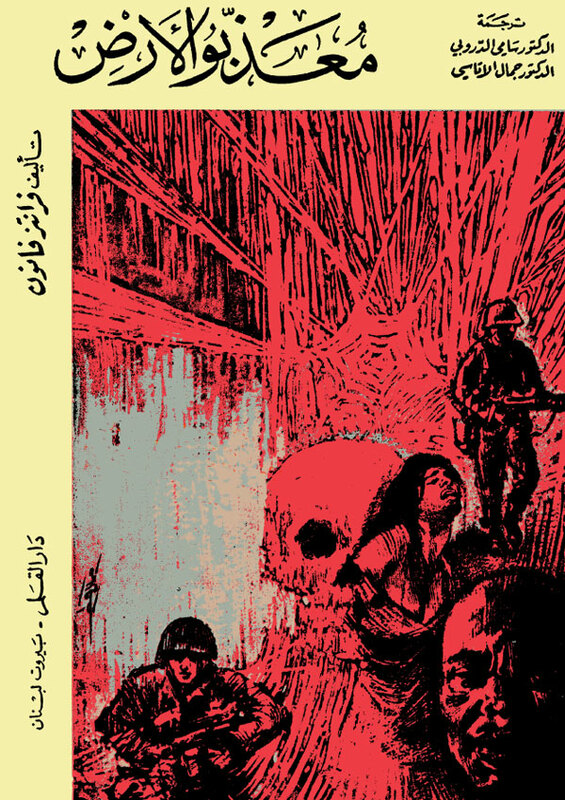 I am writing a chapter on the Arabic translations of Wretched of the Earth, and you are right – the cover with the red skull was published in Beirut. The publishing house was/is Dar al-Qalam and this edition was published in 1972. The first translation was in 1963, with several reprints. I have other Arabic covers if you are interested.